Donald Trump is not is an economic conservative. He sometimes pays lip service to conservative ideas and has come out in favor of cutting taxes, but these are not the central tenets of his campaign. This is both a stark departure from previous Republican presidential candidates and a large part of why Trump was able to defeat the 16 other candidates during the primary. The Republican Party rode a platform based on cutting taxes and government expenditures as far as they could, but electorally this strategy is played out. It no longer works and the reason why it no longer works is straightforward. The two largest federal programs are Social Security and Medicare, both of which directly benefit senior citizens. In many ways, the federal government’s budget is best viewed as a massive wealth transfer program from the young to the old. Take a look at the age breakdown by ethnic and racial group. The most common age for whites is 55; this is compared to eight for Latinos, 24 for African Americans, and 33 for Asians. The majority of whites are either on Social Security and Medicare or will be on them in the near future. Combine this with the fact that Americans are living longer than ever and that whites live substantially longer than African Americans, the slant in entitlement spending in favor of older whites becomes even more obvious. Paul Ryan, the Speaker of the House and the intellectual leader of the classically liberal wing of the Republican Party has made entitlement reform (i.e. scaling back entitlement programs) a key priority in his policy agenda. The trouble for Ryan is that any type of meaningful entitlement reform will be aimed directly at his party’s core constituency. People typically associate entitlements with welfare or food stamps or other programs that benefit groups that are often perceived as undeserving. The trouble with these views is that these programs are a drop in the bucket compared to Social Security and Medicare. 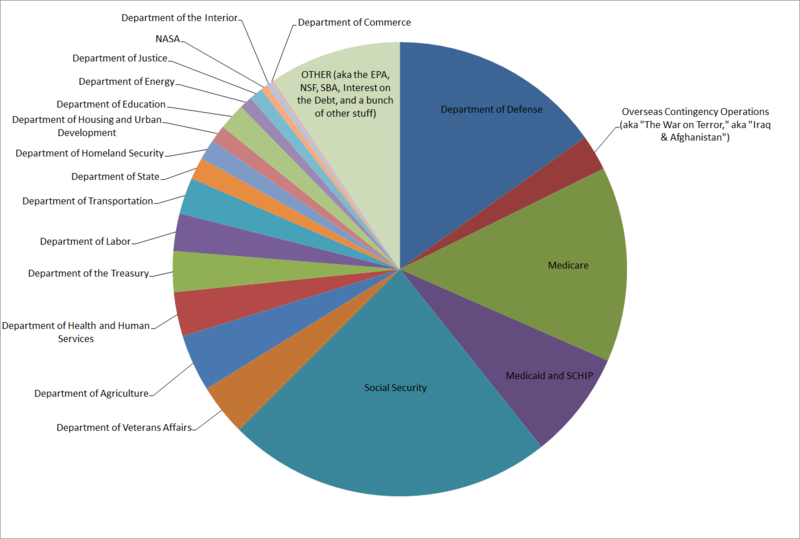 Welfare is administered through the Department of Labor and food stamps are administered through the Department of Agriculture, and these Department’s entire budgets (these federal agencies do many things other than administer these programs as well) are just slivers of the pie compared to Social Security and Medicare. Despite popular perceptions, any type of meaningful entitlement reform would hurt key Republican constituencies the most. On entitlement reform and questions regarding the size of government more generally, Paul Ryan is a general without an army—his positions are out of step with the interests of his party’s core constituents. This problem is compounded by the fact that federal tax cuts—one of the other central planks in the Republican platform—do not hold much of an appeal for the average American. Typically, the justification for cutting government spending (including entitlement programs) is that these reductions in expenditures can be passed along to the electorate in the form of a tax cut. However, it is not clear that the majority of the electorate stands to substantially benefit from a reduction in federal income tax rates. This is because the average American pays little federal income tax. The median household income in the United States is roughly 55 thousand dollars per year. Most households earning below the median are actually getting money back from the federal government in the form of tax credits—their tax rates are effectively negative. Even households earning up to 100k a year are paying roughly 6 percent of their income in federal income taxes. The implication of this is that most Americans do not stand to substantially benefit from a reduction in the federal income because they are already paying very little. Any reduction in the federal income tax rates would overwhelmingly help the rich. If the Republicans wanted to give the majority of Americans a tax break the payroll tax would be a logical place to look to cut. For most Americans, the bulk of their federal tax burden comes from payroll taxes. The problem is that these payroll taxes are used to directly fund Social Security and Medicare (in addition to unemployment insurance and other programs)—the two programs that are both crucially important to Republican constituencies and are going to require more and more money to fund over time as the population ages. Thus, cutting taxes here does not seem particularly realistic from a policy standpoint nor popular electorally, given they will be associated with cuts in key entitlement programs. The overall implication of both of these trends—the increasing reliance of Republican voters on federal entitlement programs combined with the low federal tax burden on the average American—means that the promise of tax cuts and entitlement reductions are not appealing to most Americans and especially to older whites. Intuitively, Trump understood of how little importance laissez faire economic positions were to Republican voters. The commitment to conservative orthodoxy that appear in the pages of the Weekly Standard and National Review appeal to the conservative intelligentsia but almost no one else. Most Republican voters have no problem with big government programs so long as these programs work to their benefit. Trump’s success was due in large part to realizing how little the average Republican voter cared about conservative economic orthodoxy and how little many of them had to gain from federal income tax cuts. Republican elites were baffled by Trump’s approach, which was orthogonal to the typical set of Republican positions, and largely helpless when it came to stopping him. Republican elites were so wedded to the traditional Republican positions that they were blind to the fact that there was a huge disjunction between these positions and what their base wanted. Trump was much more attuned to the Republican base. Opposed to stressing cutting entitlements, taxes, and appealing to evangelical Christian sentiments, Trump channeled white hostility towards immigrants and ethnic and religious minorities, anxiety over changing demographics, opposition to free trade, and the economic stagnation that has plagued the working class and managed to form a coalition around cultural conservatism (and, of course, Trump’s unique cult of personality) opposed to small government, free market classical liberalism. It is not clear how this disjunction within the Republican Party will be resolved. Trump is closer to the Republican base on the issues than the majority of Republican elected officials. Some of Trump’s support is likely due to the cult of personality he has fostered. However, the deeper underlying demographic and economic issues that Trump has successfully tapped into are long-term phenomenon, and the circumstances that facilitated Trump’s rise will not suddenly disappear once the election is over. There is no way of telling what direction the Republican Party will go in in the future, but this basic disjunction between party elites and voters on core entitlement and broader size and scope of government issues will not be easily resolved. In some sense the Republican Party is a victim of its own success. They have effectively removed so many people from the tax rolls (and reduced the tax burden for numerous others) that the appeal of additional cuts in the federal income tax rate has lost some appeal for the majority of voters. This entry was posted in American Politics, Current Affairs by Joshua Zingher. Bookmark the permalink.